If Congress and President Obama are ever going to get serious about tax reform, they will have to rethink some of the biggest and most popular tax breaks. Those tax breaks mostly benefit powerful voting blocs: the middle-class and the wealthy. Only one break in the top 10 is for corporations, which are allowed to defer paying federal income taxes on earnings by their foreign subsidiaries until that money is brought back to the United States. The deferral will cost federal coffers $265 billion over the next five years, according to new estimates from the Joint Committee on Taxation. The JCT is the House-Senate panel that analyzes tax legislation. It released its latest line-by-line analysis of tax breaks on Friday. The No. 1 break -- the health care exclusion -- will cost an estimated $760 billion over five years. The exclusion applies to the money a company contributes to help pay for an employee's health insurance coverage; the employer's contribution is treated as tax-free income to the worker. The numerous tax breaks offered to individuals for retirement savings (in pension plans, 401(k)s and IRAs) come in a not-so-distant second at nearly $709 billion. Right after that is the lower rate on capital gains and dividends, which will cost federal coffers an estimated $616 billion over five years. The popular mortgage interest deduction claims the No. 4 spot, with a $379 billion price tag. 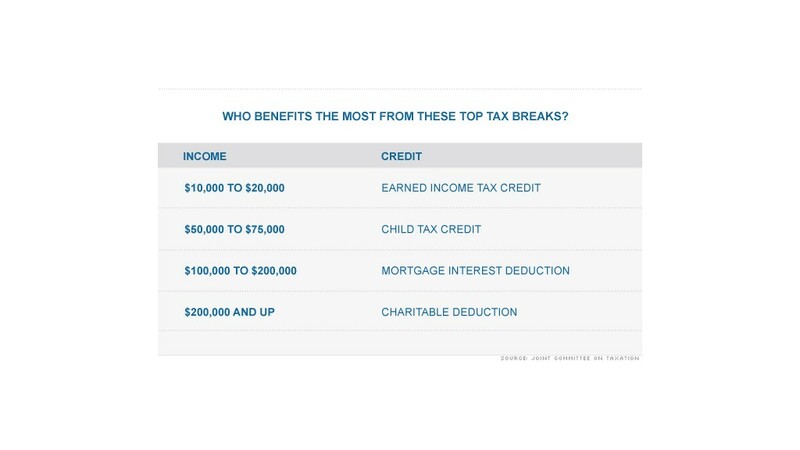 That's just above the $326 billion Earned Income Tax credit, the only tax break in the top 10 that primarily benefits low-income filers.